This build has nothing to do with Planescape's Lady of Pain. It is called so because I usually like to play female characters in this game, but it would work equally well with a male character. Hereby I present you with an off-tank DPS build that makes of maxing out MIGHT an art. I call this a 'preview' because I conceived this build with patch 2.0 in mind (i.e. with PER granting a bonus to Accuracy rather than Deflection); however, it works very well—and is very powerful—already in 1.06. For readability, I will be dividing this post in paragraphs and hide the content of each paragraph with SPOILER tags, so you may expand and collapse them at your leisure instead of being faced with a text wall at all times. 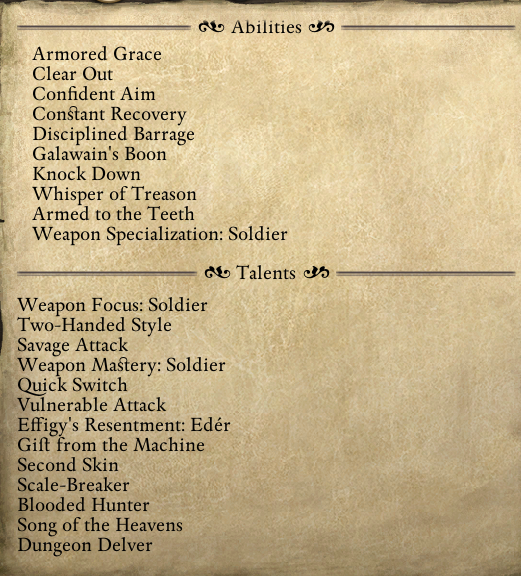 The concept behind this character is a Stoic (primary) / Aggressive (secondary) Fighter that exploits the Frenzy + Consecrated Grounds combo from wearing Sanguine Plate and Shod-in-Faith; maximizes MIGHT; gains an overall +10 Accuracy bonus from PERCEPTION; and opens fights with a single, massively damaging shot from an Arquebus before cutting enemies down to size with a Great Sword. Maximizing MIGHT score. This implies playing as an Aumaua from The Living Lands to get a starting MIGHT score of 21, then getting the Gift from the Machine in Heritage Hill (which is Cruel), sacrificing Edér to the blood pool in Skaen's temple (also Cruel), and getting Galawain's boon in Twin Elms. Wearing Pensiavi mes Rei and eating a Dragon Meat dish, you'll have a MIGHT score of 30; with a Champion's Boon spell from a Priest, 37. Getting the Gauntlets of Accuracy. You need them to offset the -5 Accuracy penalty bestowed by the Savage Attack talent. You can either use this guide to time your incursion in Raedric's Hold to get them, or rely on the IE Mod's random loot shuffler if you feel like reloading a few times. Or, you know, you can always cheat. Opening the fight with an Arquebus shot. This is the feather in the character's cap, and it requires that you take the Weapon Focus: Soldier talent (which unfortunately means you're going melee with a Great Sword rather than with an Estoc, unless you go for a full-melee build.) Arquebuses do an insane amount of damage, and even more so when your MIGHT score is 37 and you have Weapon Specialization: Soldier and Weapon Mastery: Soldier to boot; by the time the enemy's come close, they'll have already regretted aggroing you in the first place. You'll also need the Quick Switch talent so you can start maiming your enemies as soon as they engage you after you shot them with your Arquebus. As mentioned above, this character must be an Aumaua from The Living Lands. Note: This character can be built as a pure melee or pure ranged variant as well, depending on your talent selection. I will illustrate those in the next post. Whisper of Treason is granted by Munacra Arret. Because of your stellar MIGHT and elevated DEXTERITY and PERCEPTION scores, your Fortitude and Reflexes are pretty good. You can therefore have your casters use AoE spells that target those defenses with ease even if the Lady of Pain is into the fray. Your Will is subpar, although wearing Munacra Arret gives you a handy +15 boost that makes it decent. A Dragon Meat dish will make up for the three points of RESOLVE you have given up. However, your Will is still weak so do not buff the Lady of Pain's attacks when fighting against enemies that can charm/confuse/dominate you or the rest of your party will be in for a world of hurt. Always keep a Scroll of Defenses handy. Your insanely high MIGHT score sends your Constant Recovery through the roof, so you heal fast even without Tidefall. Your +10 Accuracy from PERCEPTION (actually +20 when buffed with Champion's Boon) guarantees you will almost always hit and often crit. Add a Potion of Merciless Gaze and a Scroll of Valor (or Flask of War Paint) to the mix, and you'll crit like there was no tomorrow. Make sure you are wielding Pliambo per Casitas when combat starts. If the enemy is distant enough, use a Scroll of Valor right away to get a +15 Accuracy boost; otherwise go for Disciplined Barrage which gives you +10 almost instantly. While the enemy approaches, shoot them; this will cause them a lot of damage and inflict a -5 penalty to all their defenses before they can do anything. In the meanwhile, have your Priest cast Champion's Boon (and Crowns For The Faithful if you want to boost your Deflection and Will for a particular encounter) on the Lady of Pain. If they are not already active on the Lady of Pain, activate Savage Attack and Vulnerable Attack. As the enemy gets close and engages you, switch to Tidefall. Your high DEX score paired with Armored Grace and the Quick Switch talent will enable you to land a hit almost immediately, and it will hurt. Big time. The Gauntlets of Accuracy offset the Accuracy penalty from Savage Attack; your DEX score offsets the attack speed penalty from Vulnerable Attack. You'll be actually surprised how fast this character attacks considering they are wearing plate armor, wielding a two-hander, and using Vulnerable Attack. The Dungeon Delver talent gives you a 10% bonus damage when critting, which is always nice. You want to deal as much damage per hit as possible; this is unchanged from the "main" variant of this build. Hence, you will be still using an Arquebus. The DR bypass from the Arquebus stacks with the DR bypass from Penetrating Shot, so you will be using both to obtain a whopping 11 DR bypass. Because you'll stand in the back line most of the time, you won't get hit as often. Hence, you will let go of the Sanguine Plate + Shod-in-Faith combo in favor of ligther armor that doesn't slow you down as much, and perhaps a pair of Boots of Speed. The Whisper of Treason ability you get from Munacra Arret, an extra I wouldn't normally use with a melee build (pure or otherwise), becomes a valuable asset in the pure-ranged build: If an enemy gets too close, you whisper-of-treason them and resume shooting at distant targets, thus taking advantage of the Marksman talent. Others are really up to you. As mentioned above, you may want to hold onto Quick Switch for enemies that get close to you, that you may slice them right away with your Great Sword. You may want Shoot On The Run unless you too, like me, disabled the recovery penalty from movement through the IE Mod. You may want to build your Fighter more defensively because you'll be wearing lighter armor, taking the Vigorous Defense and Critical Defense abilities (whereas you won't probably need Knock Down.) Or you may hold onto Two-Handed Weapon Style to maximize damage output when you are forced to switch to melee. Because you give up on opening fights with an Arquebus, you are free to replace your Weapon Focus/Specialization/Mastery Soldier with Adventurer and go melee with an Estoc. Hence, you can stack the Estoc's DR bypass and the DR bypass from Vulnerable Attack to a whopping 10. Also because of the above, you will not need the Quick Switch talent any longer. You may still open fights with a ranged weapon if you like the idea of getting a "free" hit through before you even start, but you'd be using a War Bow to that end; War Bows attack faster than Arquebuses and you have a whopping DEX score, so chances are you can switch to your Estoc immediately after shooting an arrow and still have enough time for your recovery to expire before the enemy reaches you. If your enemy is not distant enough for this, give up on the War Bow and welcome them with a Disciplined Barrage + Knock Down instead. My weapon recommendation is The White Spire Estoc, which you can purchse from Dunstan at Crucible Keep (and should of course enchant to Superb.) The reason is of course its Disorienting ability, which inflicts a -5 penalty to your target's defenses per hit. Make it work in combo with Knock Down, which inflicts Prone status, and you're in for a crit fest that gets more ridiculous by the swing. Edited by AndreaColombo, 18 July 2015 - 11:56 AM. Added the pure-ranged and pure-melee builds to my second post. If you've read about my pure-ranged build earlier this morning, it might be worth going through it again as I've made a few changes and additions. This is great, AndreaColombo. What I like about it is that it's a good outline for any melee 2h weapon class. As Torm51 implied, the outline of your build can be applied broadly with good effect. The Rauatai Sweet Pie can be crafted from Cocoa, Sugar, and Fruit which are all fairly common, low-cost ingredients; alternatively, it can be bought in taverns; chances are you won't have a problem keeping some in your quick slots at all times. It provides a handy +2 bonus to DEX (which is what we're really after) as well as +10 Endurance which is a nice bonus since the Lady of Pain's CON ain't her strongest attribute. It is worth mentioning that the pie also has a whopping 300-second duration. 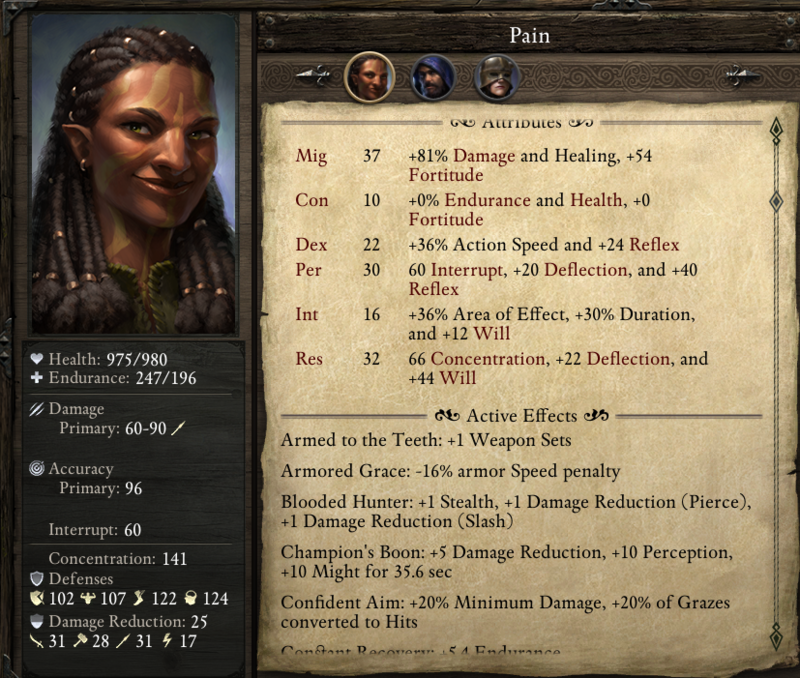 When I play the Lady of Pain I tend to pump its Survival skill to 10 (to which Sanguine Plate adds another +2 for a total of 12) which makes it last north of 400 seconds. So you'll be walking around with a DEX score of 22 more often than 20. In the pure-ranged variant's description, I wrote that your level-12 Accuracy remains unchanged at 116 when fully buffed. That is incorrect: Because you'll also have the Marksman talent—and you'll likely be targeting distant targets over 90% of the time—your Accuracy is actually 121. Both characters were almost perfectly synchronized; however, because DEX also affects attack animation speed, the Lady of Pain landed her hits a few frames before the 10-DEX Fighter. How attack speed works is subject to debate, although frame by frame analysis suggests things don't work exactly as advertised in-game. I plan on running more tests in the future; these are just some results I got by running a quick preliminary test out of curiosity. Edited by AndreaColombo, 27 July 2015 - 05:45 AM. Nice guide with really good formatting and presentation. 1.) Why go with a 10 intellect? With a 3 you'd have 7 more points to put somewhere, perception could be good for more interrupt currently or more accuracy after 2.0, more resolve would be good to reduce being interrupted or even more con to give you more hit points as you plan on getting hit anyway. knockdown goes from 5 seconds to 3.5 seconds which is long enough compared to the benefits of 7 more stat points. Is it for the duration of the shod in faith boots? 2.) The return on another +1 might is less than what +1 dex would get you. 37 might and 22 dex does less dps than 36 might and 23 dex, especially if you have the +25% from mastery and the +20% from savage attack. Going with the Dread Archipeligo for the dex boost might be better. 3.) Boreal dwarf would be a comparable substitute. The might would be the same, dex can still be a 17, 18 with Dread Archipeligo, and the +15 accuracy to two of the more common enemy types is a noticeable buff when it is in play. You'd lose out on a second arquebus shot unless you added in the perk that gets you another weapon slot that I can't think of the name. Plus you'd be a dwarf which is infinitely better than any other race. In general, I don't particularly enjoy min/maxing; therefore I chose not to go for extreme min/maxing with this build. There is something about seeing an abysmal score in any given stat on my character sheet that just rubs me the wrong way. I dropped CON by 3 points because I knew I could wear a belt that would make up for it; likewise, I dropped RES by 3 points because I knew I could gain them back through a Dragon Egg dish or a Dragon Meat dish. Both points boil down to personal preference, and it is certainly possible to apply min/maxing to this build to further optimize its DPS. I'm guessing Crowns of the Faithful, crazy powerful priest buff spell. It also improves Per and Int, but not as much. Note those screenshots do say "fully buffed." A good strategy is to cast Crowns of the Faithful on the Lady of Pain immediately after she gets critted, so she can reap the benefits of Frenzy while being protected from further hits/crits. * The recovery bar over the character's head actually takes exactly 42 frames to go from full to empty, thus corroborating the math. However, there seems to be a 4-frame delay from the moment the bar is empty to the moment the character attacks again. This is consistent with what was observed in this thread I linked earlier. Edited by AndreaColombo, 02 August 2015 - 01:31 AM. So: 22 DEX (+36% attack speed which applies to everything); plate armor (50% recovery penalty reduced by 16% with Armored Grace); Penetrating Shot (20% recovery penalty); Gunner (20% faster reload). 1) Doesn't Penetrating Shot reduce attack speed rather than recovery speed? 2) Are you certain that Dex is added to the other recovery modifiers, or might it be multiplied at the end after the recovery modifiers have been added? I don't know which it is. I'm curious. I just assumed Dex would be multiplied at the end to everything, but maybe not. 1) I'm pretty certain everything that says "attack speed" in the game only affects recovery except DEX (which affects everything) and stuff that explicitly relates to reloading (e.g. Gunner talent and one of the Chanter's chants.) I can test it next weekend to confirm. Next weekend I will probably open a new thread to run and discuss these tests. Edited by AndreaColombo, 03 August 2015 - 11:02 AM. Ability choice for level 13 is Sundering Blow. Talent choice for level 14 is Apprentice's Sneak Attack. Sneak Attack works on Prone targets, so you're going to exploit it in combo with Knock Down. In light of this, Bonus Knock Down becomes the best talent choice for replacing Quick Switch in the pure-melee build. Tidefall has been changed and no longer has the ability to drain life from targets. It does however have the ability to shorten the duration of beneficial effects on them and steal 10% from their attack speed (basically it speeds you up while slowing them down); if at all possible, it is even more powerful. As far as soulbound weapons go, St Ydwen Redeemer will likely be a good substitute for Tidefall for this build (even though the change to Tidefall makes it very competitive); its ability to proc Pillar of Faith is awesome as that spell can inflict the Prone status, which works in combo with your Apprentice's Sneak Attack talent. Note that there appears to be a bug whereby Weapon Mastery doesn't stack with Weapon Specialization. This effectively hinders this build a lot, so hopefully it will be fixed very soon. FYI, in beta 2.0 patch at least, food for different attributes and stack, so you can cheaply get +2 to all stats at the same time. Prostitute boons, except for Serele who is once only anyway, don't stack with themselves, but they stack with resting bonuses. So you can add another +2 Mig from the female dwarf on the 2nd floor of the Salty Mast. Retrain your Dex and Con to 18s before hiring her for the first time. She enjoys your company she refunds your coin and she becomes an available stronghold hireling. You can still lay down with her in the stronghold, but no boon is granted Repeat with the other staff if desired then retrain back to your normal stats and they'll continue to buff you for free. I wouldn't be surprised if the food stacking is unintended and will be patched. what you describe has been confirmed by QA as being a bug and it will likely be fixed in next week's patch. Basically these weapons are supposed to only steal 10% attack speed from the target but are set to steal a much higher amount. As mentioned above, Apprentice's Sneak Attack is an ideal talent for this build as it works in combo with Knock Down. Bonus Knock Down therefore becomes the best replacement for Quick Switch if you're not opening the fight with an Arquebus shot. Ghost Hunter is a good alternative to Weapon Mastery as you trade in +10% damage against everyone for +25% against Spirits, who are among the most annoying foes the game has to offer (and abound in Durgan's Battery, as well as in the Alpine Dragon fight.) Both choices are good, so it's really up to personal preference. Sundering Blow is a great ability for this build to have as it gets you +20% damage as well as a nifty DR reduction. If you knock them down first, you'll increase your chances to crit with Sundering Blow, thus increasing its duration. Then you can disable Vulnerable Attack and enjoy an increased attack rate while the enemy is down and has -8 DR on top of that. Dozen's Luck gets you a 4% Crit-to-Hit conversion that stacks with the same bonus from Durgan-reinforced armor. You'll still be critted in every encounter, especially if you play on POTD, but some protection from further crits is definitely welcome. After all, the only crit you need is the one that unleashes Frenzy + Consecrated Grounds. Flick of the Wrist gives you +4 Accuracy with Dagger and Stiletto; it would be completely useless for this build if it didn't apply to soulbound weapons as well. This may or may not be a bug (they might have made it apply to soulbound weapons to give them an edge since they can't be enhanced with Durgan steel), but for as long as this is the case, it is worth taking. Garodh's Chorus in its "offensive" version (i.e. picking all the offensive dialog options) is a great alternative to Munacra Arret. Not only does it get you +3 MIG, thus freeing up Pensiavi mes Rei for another party member—it also gives you Retaliate, which is very good to have for a build that gets hit as often as this one. St Ydwen's Redeemer is a very good weapon to have when you fight Vessels, but is otherwise inferior to Tidefall. I therefore suggest you keep the latter as your main, switching to the former when fighting Vessels. You definitely want to enhance Sanguine Plate and Tidefall with Durgan steel, as that gets you +31% attack speed (in total) as well as protection from crits and Hit-to-Crit conversion. Tidefall was already ridiculous and becomes even more so with this enhancement. Pets are merely cosmetic, except for Concelhaut's Skull which actually lets you summon Concelhaut to fight for you. A no-brainer for any character, imho. 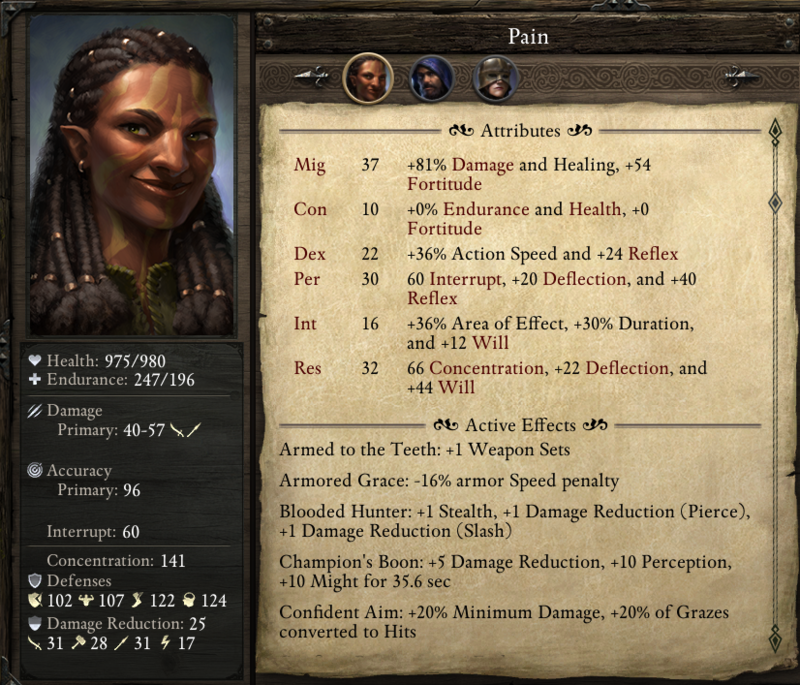 In my play through I found Potion of Deleterious Alacrity of Motion to be much more valuable than Flask of War Paint, and sipping one at the beginning of combat to be an even better opening move than the Arquebus shot. With a high Survival score (which I usually go for when I play this build), the potion's duration is enough to outlast most encounters and the increase in DPS you get from the +50% attack speed is invaluable. Scroll of Defense (cast by someone else in your party) is a must, so try to always have some handy for any fight that is tougher than a trash mob. Champion's Boon remains the main buff for the Lady of Pain—the one that makes her DPS skyrocket. Blessing offers a damage bonus as well as a +5 Accuracy bonus that, for some reason, stacks with Devotions of the Faithful. Probably bug. Until it gets fixed, using these spells in conjunction for a total +25 Accuracy is a must. Crowns for the Faithful is of course a no-brainer to buff your defenses. Dire Blessing offers a Hit-to-Crit conversion that stacks with that offered by Durgan steel, so it's worth casting as your last Priest buff. Edited by AndreaColombo, 14 September 2015 - 09:35 AM. I was referred here by your response in a thread I made, and after reading through all this I wanted to take a moment to say great format and great information - PoE can have such a wealth of depth, and your guide is helping to digest it all.